Merry Christmas Baby! Santa gave you a new roof! 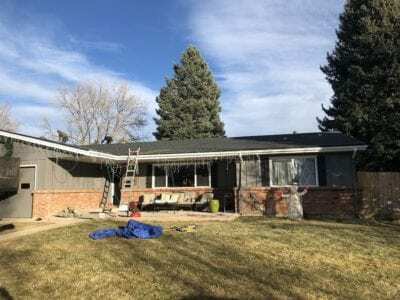 This home in Colorado Springs got a new roof for Christmas. The mild weather provided an opportunity for people to get a new roof installed during early January. Our weather, as we know, can be warm andgorgeous or snowy this time of year. As long as the roof decking is clear of snow and ice and the outside temperature isn’t too low, we can install roofs year ’round. This home is located near the beautiful Broadmoor area of Colorado Springs got a new roof from insurance proceeds. This area was hit twice this past year with hail. Some people had their roof replaced after both events! Ugh -not fun for them. If your neighborhood had hail this past year give us a call and will inspect your roof for free. We are certified roof inspectors by Haag – Haag is the most prestigious and recognized name in certification for roofing contractors. The insurance industry recognizes this credential as valuable. We are often called for our expertise in inspections.